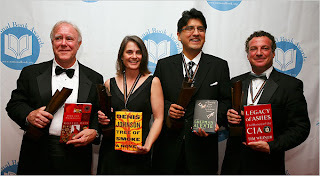 Pic shows Robert Hass, left, Cindy Johnson, the wife of Denis Johnson, Sherman Alexie and Tim Weiner with their awards Wednesday night. The influence of a National Book Award at bookstores can be mixed. Last year’s fiction winner, “The Echo Maker” by Richard Powers, sold 52,000 copies in hardcover and 31,000 copies in paperback, according to Nielsen BookScan, which measures about 70 percent of retail sales.